Biodiesel producer • Accusations include false claims of producing millions of gallons of biofuel; the company insists it was a misinterpretation. 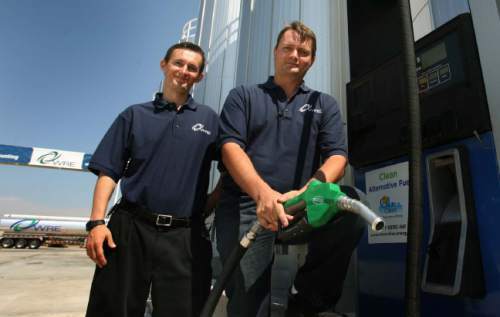 Leah Hogsten | Tribune file photo Kingston brothers Isaiah (left) and Jacob co-own WRE or Washakie Renewable Energy, that produces 10 milion gallons of biofuel. The largest biodiesel producer in Utah, Washakie Renewable Energy, held an open house in Plymouth on Thursday, September 1, 2011 to showcase its new production facility. Leah Hogsten | Tribune file photo A rail line outside the Washakie Renewable Energy facility in 2011. Leah Hogsten | The Salt Lake Tribune Washakie Renewable Energy held an open house in Plymouth on Thursday, September 1, 2011, to showcase its new production facility. 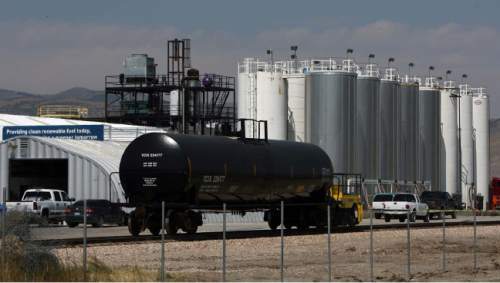 Utah&apos;s largest biodiesel producer has agreed to pay a $3 million fine to resolve allegations that it sold credits associated with renewable fuels it had not produced, although the company attributes the violation to a "misinterpretation" of the law and says it fully cooperated with investigators. Washakie Renewable Energy built its plant in Plymouth, 100 miles north of Salt Lake City, in 2008 with the goal of turning grease, animal fat and other oil wastes into liquid fuels. It now produces 10 million gallons a year. Washakie produced no biomass fuels between January and October 2010  although it collected $2 million based on having produced millions of gallons, according to a suit federal lawyers filed, along with a stipulated settlement, on Thursday in U.S. District Court in Washington, D.C. Under the federal Renewable Fuel Standard program, businesses that produce or import fossil fuels must buy credits from renewable-energy companies. The companies generate the credits they sell based on the volume of renewable fuel they produce. The credits, or renewable identification numbers (RINs), that Washakie generated, reflected 7.2 million gallons of biodiesel it claimed to have produced in 2010. "The defendant made quite a profit by failing to adhere to the requirements of the .... regulations," said Assistant Attorney General John Cruden in a statement. "The penalty here sends the message that renewable fuel producers will be held accountable for meeting all legal requirements." Washakie said it self-reported its misinterpretation of the law in 2010 "and fully cooperated with the [U.S. Environmental Protection Agency] in an effort to strengthen the integrity of its compliance record." The firm "has an excellent compliance record and is committed to its vision of renewable fuel&apos;s continued growth and continued commitment to compliance, national independence from foreign oil, and greenhouse gas reduction," its statement said. Washakie founders Jacob and Isaiah Kingston are sons of wealthy Utah polygamous patriarch John Daniel Kingston. The case arose from a notice of violation the EPA issued in February 2011, following an inspection. Later that year, the U.S. Department of Agriculture&apos;s Rural Development Office extended the company a $496,750 grant, observing Washakie&apos;s process could help reduce U.S. dependence on foreign oil. The invalid RINs the company sold represent the equivalent of 30,000 metric tons of carbon dioxide emissions. In a gesture to correct the wrong, Washakie has since purchased a similar amount of credits, according to the EPA. "Making sure producers are supporting their claims with production of actual renewable fuels is critical to reducing greenhouse gas emissions that are fueling climate change," said Cynthia Giles, assistant administrator for enforcement and compliance assurance, in the Department of Justice statement.